“Each island has its own legends, history and dialect,” explains playwright Wayne Moniz at the start of his new short story collection “Under Maui Skies.” Though it’s questionable whether most readers will need this or further explications of island history, let alone the brief pronunciation guide and glossary, Moniz’s contextual observation of island diversity is actually an unintentional but fitting echo of the book’s own remarkable range. The result of a personal challenge to branch out into fiction, Moniz’s collection features seven stories set on Maui in different time periods and genres, from a classic western to a UFO science fiction tale. Thirteen elegant kaona follow, but with the exception of his previously published poem ‘Wailuku, 1957,’ they at first seem merely indulgent afterthought. Instead the cynosure is the stories, which promise and delivers the unexpected, bringing myth, legend and place to life in a distinctive way. This innate success makes it easy to overlook small problems with prose, such as awkward phrasing like “Kaui turned over frustratingly to face the full moon,” and Moniz’s tendency to mimic script pacing with significant time jumps and dialogue that reads like stage direction. Amongst rich imagination and personification of the natural world, the tales remain grounded by a thoughtful foundation of historical and personal fact. The title story, a surprisingly natural western, has origins in conversations with former old-timer Haleakala Ranch workers who claim the villain who Ramon, the protagonist, is tasked with apprehending was real. However, Moniz doesn’t shy from important creative liberties, and starts out with romance as Ramon innocently sleeps with his cattle as “A thousand stars glistened in the heavens,” and ends with comedy instead of tragedy. In ‘Aunty Becky’s Tavern,’ Moniz explores intimate personal history, tracing his father’s wartime experience in Guadalcanal after the start of World War Two, a hazy, time travel story where one specific place—the old Kihei watering hole—remains constant. Others are simply for personal fun, such as the humorous and spot-on echo of classic 1930s noir in ‘Aloha Sweetheart,’ which starts out shining with evocative sentences like “In kona weather, thieves got itchy fingers, punks beefed, and dames plotted,” before burning out in a muddled ending. 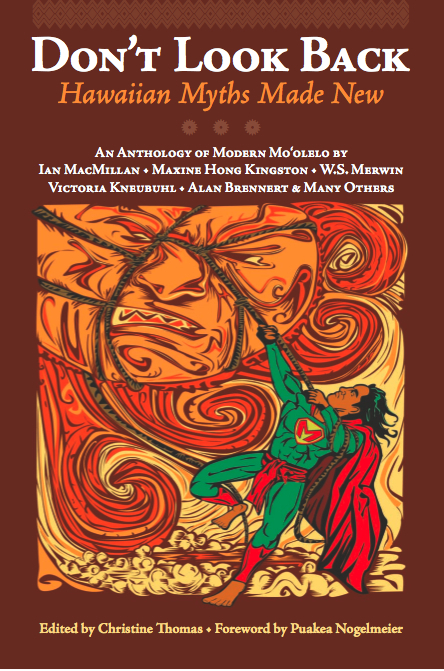 Ultimately, “Under Maui Skies” fulfills Moniz’s aim “to preserve the memory of a time that is slipping away,” offering an enjoyable snapshot of cultural and personal lore, and is a timely reminder that, as one of the collection’s most memorable stories, Luahinepi’i, an original evocation of the legend of the climbing woman of ‘Iao Valley shows—not knowing our history doesn’t mean it doesn’t exist.